The bonus = basic salary + NWC allowance. That year in July 1995 the bonus was 1.6 month which is similar to this year's bonus for the staff and crew. However, I did not get the SG 50 ex-gratia payment of $500 because it was SG 30. 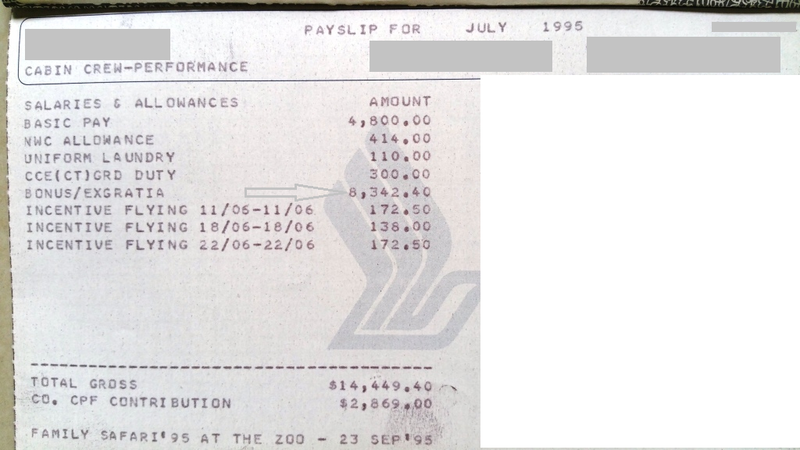 You will also notice the location meal allowances were not reflected on the payslip as they were paid separately into our OUB (now UOB) bank account. The average LMA for a CCE was $1,500 a month, half that of an IFS's.